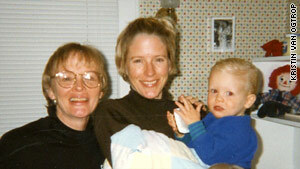 Kristin van Ogtrop with her young son and her mother. Editor's note: Real Simple Managing Editor Kristin van Ogtrop took time away from her busy life, her husband and three children to write the book "Just Let Me Lie Down: Necessary Terms for the Half-Insane Working Mom." (CNN) -- Here are seven ways my mother and I differ on raising children (and one way that is exactly the same). Like my mother, I have three children. Like my mother, I am honest to a fault, can only take so much caffeine and really think that a woman should wear a slip if her skirt is the least bit see-through. This is a particularly wonderful meal-in-a-box that was never a dinner option when I was growing up, and not just because there was no Trader Joe's in my town. My mother made dinner from scratch every single night and did not rely on prepared food in a pinch, which is basically the only way my family stays alive on certain crazy days. ...or the preferred beverage of my children, at least on those wonderful/awful afternoons they come to see me at work. My mother did not work outside the home when I was small, meaning she did not have a corporate office to ransack once I was all sugared up on three hot chocolates. No. 3: "Whose sweatshirt is that?" Also known as: "Why is there a ladybug umbrella in our yard?" and "Did anybody walk the dog?" and "I didn't know we had a hamster!" All things you find yourself saying from time to time when you are a working mother who is gone for most of the day, when -- as it turns out -- lots of interesting stuff happens (or doesn't, when it comes to the care and feeding of the dog). The woman I will never be, at this rate. When I headed off to college my mother was 44 and let me tell you, she looked pretty good in a bathing suit. I've got the family photos to prove it. As for me, when my youngest heads off to college I will be 60. Hopefully I will still be wearing bathing suits but I am probably not going to encourage anyone to take my picture. There is lots of this in my house. Something is always breaking, and I have had to learn to ride it, like an expert surfer rides a killer wave. Such is life, apparently, when lacrosse is played in the house or wrestling is done at the dinner table. I feel powerless to stop it. Plus, I hear they make pills for this. My mother was a home economics major who taught her three daughters how to sew. I was an English major who taught my three sons how to blow huge bubbles and watch "The Simpsons." My sisters and I know how to hem a pair of pants. My sons know that there are people called tailors who prove very helpful when pants are too long. When I was a kid, a person went outside either barefoot or wearing shoes. We've since had a major societal shift, because every kid of my sons' generation goes outside in socks. Someone could write a book about this. So there are socks with holes in the heels scattered throughout my house, like a weird sort of giant bug. Back in the day, my mother (or I) might have darned such socks. Now I wait till the holes get bigger than the size of a quarter, and then I throw the socks out. This is one way in which my mothering exactly replicates the way I was raised. Although my kids sometimes eat frozen macaroni and cheese for dinner and I never hem their pants, they absolutely know that I love them. Just as I knew my mother loved (and continues to love) me.